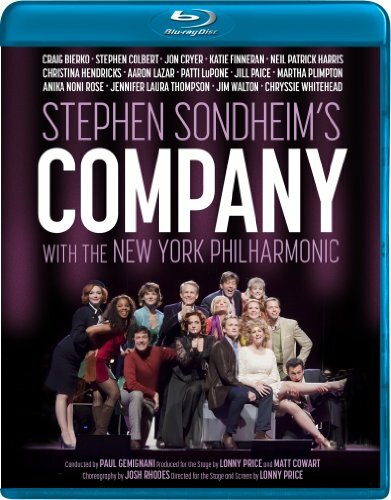 "PHONE RINGS, DOOR CHIMES, IN COMES..."
Chatsworth, CA - Image Entertainment proudly announces the release of Stephen Sondheim's legendary musical comedy Company , available on DVD, Blu-ray(TM) and digital download on November 13th. The all-star cast includes Craig Bierko, Stephen Colbert, Jon Cryer, Katie Finneran, Neil Patrick Harris, Christina Hendricks, Aaron Lazar, Patti LuPone, Jill Paice, Martha Plimpton, Anika Noni Rose, Jennifer Laura Thompson, Jim Walton and Chryssie Whitehead. Lonny Price directed the production with Paul Gemignani conducting the New York Philharmonic. The SRP for DVD is $24.98, with the Blu-ray(TM) SRP at $29.98. Pre-book date is October 16th. Set in the fast-paced crowd of Manhattan, Company is a contemporary tale of Bobby, a 35 year old bachelor--women want him, and men want to be him, or so it seems. Told through a series of vignettes, Bobby's friendships, assignations and character are revealed in classic Broadway musical standards including "Another Hundred People," "You Could Drive A Person Crazy," "Ladies Who Lunch" and the heart breaking anthem "Being Alive." It's a timeless, poignant look at relationships, friendships and, ultimately, what it means to truly love someone. Performed for four sold-out evenings with the superb New York Philharmonic, Company was filmed for theatrical exhibition in over 500 theatres nationwide. NPR rhapsodized, "Neil Patrick Harris was great, Christina Hendricks was a revelation doing pure light comedy, and Patti LuPone was Patti LuPone, for crying out loud." Broadwayworld.com enthuses, "This is Broadway in the 21st century at its best with a cast led by the brightest stars in the Broadway and TV universe on full display for a film audience." As an added bonus, both DVD and Blu-ray(TM) contain intimate production liner notes written by director Lonny Price. Company was produced by Ellen Krass Productions.